Jennifer Janviere Photography I have a fascination with skulls that goes back to my love of the Spanish Day of the Dead celebrations, complete with festive traditions, imagery and colors. 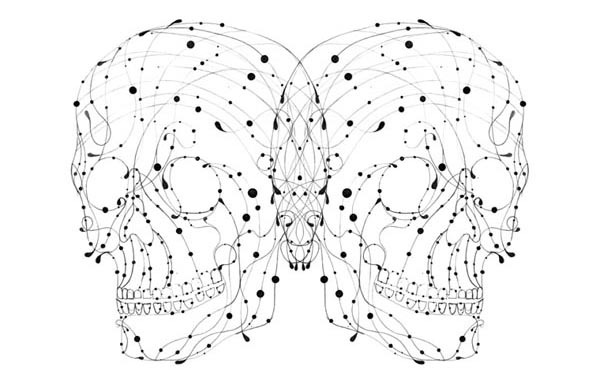 I find skulls beautiful, fascinating, immersed in culture and dripping with scientific queries. The sleek lines, variety of form, scale, and the juxtaposition of simplicity versus complexity intrigues me for long periods of inspired brain storms. It was love-at-first-site when I spotted the bone china skull ring designed by the former UK based team Mixko (the designers have split to pursue individual paths). It is my most complimented accessory and every time I slip it on I am inspired. The ring's function is not only to complete an outfit, but to add another level to living the design. I wear my inspiration whenever possible, kind of like in LA where you wear your car; fashion is a visual definition of character. In my apartment my favorite piece of art is Alexander Beeching's, Momento Vitae, a heavenly composition of imaginary constellations grouped together to form mirrored skulls. Lines converge, connect and move the eye in an original motion with each viewing. Absolutely gorgeous! Not only do I adorn skull jewelry and artwork, I jump at any opportunity to incorporate skulls into my designs. Ever been to a cow graveyard? Nor have I, however I have people! A box of bones arrived at my apartment freshly bleached from a Kentucky cattle farm, courtesy of my college pal Edwardo, and became the feature element of a set designed for Zink Magazine. What's next in the exciting adventures of design vs. bones - one can only wonder - installations, deconstructing, texture studies...ahhh the inspiration!